2 How did we research this career? 3 Why should you do biomedical research? 5 Who should consider this option? 5.1 What traits are important for success? 5.2 How can you work out whether you’ll fit this career? 5.3 What concrete signs are looked for when entering the field after your PhD? 6 Should you do a medical degree or a PhD? 6.1 Do you need to do a PhD at all? Biomedical researchers investigate how the human body works with the aim of finding new ways to improve health. Biomedical research has likely produced large returns to society per researcher in the past; we expect it to continue to be a high-impact area in the future; and it appears to be constrained by good researchers. Its drawbacks are that it takes a long time to train, has high drop-out rates and leaves you relatively fixed in the biomedical field. You should strongly consider this path if you have an undergraduate degree from a top university with high grades (GPA 3.8+); you’ve tested your fit for research by doing a placement in a lab; and you have a place at a top 10 PhD program for your specialty. However, success in this path is very hard to predict, and so we encourage you to have a back-up plan. • Biomedical research is promising cause area. • The field seems to be constrained by good researchers. • Highly interesting work for the intellectually curious. • Long time to train (4-12 years). • Highly competitive; people drop out even in their late thirties and forties. • Relatively narrow exit options. Very high intelligence, intense intellectual curiosity and interest in biomedical research, grit, programming and statistics in demand. Contact lab managers during your sophomore (2nd) or junior (3rd) year at university to get a job as a research assistant in a lab to test your fit. Then read this advice on applying to graduate school. Training is usually done either by doing a PhD in biomedical science, or by doing a medical degree. As we explain below, it’s also possible to enter without a PhD in biomedical science if you have strong quantitative skills. Note that you don’t need to study Biology undergraduate to enter many biomedical PhD programs – it’s possible to enter with other science or mathematical subjects.2 There are also masters programs that aim to help science students transfer into biomedical research, such as CoMPLEX at UCL. After training you usually start as a postdoc, and work your way up to professor level. Junior researchers spend most of their time in the lab, while senior researchers spend most of their time managing, writing papers and speaking to other researchers. More on what it’s like at the different stages. How did we research this career? We interviewed three leading senior biomedical researchers in the UK: Prof. McMichael and Prof. Townsend3 (both work on vaccines for infectious diseases) and Prof. Todd (who works on the genetics of disease). We also interviewed Dr. Ewer, a mid-career researcher working on vaccines, read GiveWell’s interviews on biomedical research, interviewed Holden, the co-Executive Director of GiveWell, by email, read the most relevant challenge paper from the Copenhagen Consensus, and did a web search for existing advice. Why should you do biomedical research? Overall, our view is that biomedical research is a promising cause. However, these estimates have been criticised and so shouldn’t be taken at face value, and may not reflect returns from future work. Biomedical research also contains some very exciting areas of research that could offer enormous upside, for instance anti-ageing research and synthetic biology. Biomedical research is also a priority area being investigated by the Open Philanthropy Project, which we think is one off the best groups that looks for causes with opportunities to accomplish as much good as possible – suggesting there may be opportunities to have outsized impact here. The fact that lab leaders would be willing to forego large amounts of grant money for a single good researcher suggests that (i) more grant money isn’t a very effective way to attract top researchers, and (ii) top researchers are more valuable than the other things that lab leaders can buy with grant money (like lab equipment). Although we expect this to overestimate the extent to which the field as a whole is constrained by good researchers,8 it suggests that if you have the potential to be a top researcher, contributing to this cause through direct work is likely to lead to more impact than contributing to the cause by donating. Have high autonomy. Through most of your career, the work you do is largely self-directed. In the earlier stages, you’ll be put on projects by your supervisor, but even then you’ll be highly independent day to day and probably able to have a substantial say over what you do (though this varies by lab). Have a lot of variety. Biomedical researchers investigate many different questions, use different techniques and technologies, and collaborate with people around the world. However, it’s weaker for job satisfaction in that many projects take years to bear fruit, which can be less motivating. We’ve also heard that during your PhD the work can be quite monotonous (like counting fruit flies). Biomedical research is highly competitive, and most people don’t make it to tenured professor roles. 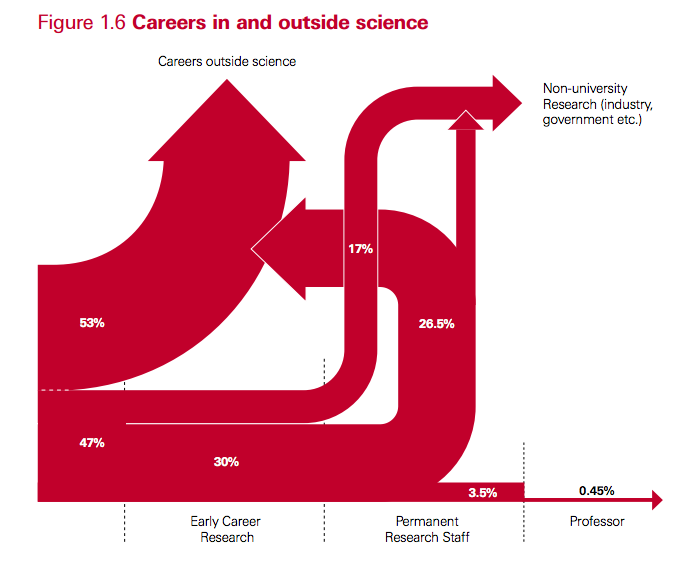 In the UK, only 3.5% of people with a science PhD make it to permanent research positions in academia, and only around 20% end up in any sort of research roles. Source: The Royal Society Note that “permenant research staff” in the UK is similar to “professor” in the US – the proportion of professors in the UK is much lower. 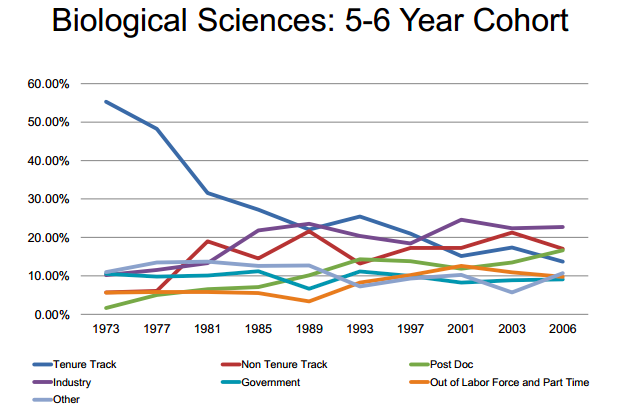 This trend is likely due to the increase in the number of PhDs being produced, without a corresponding increase in the number of tenure track positions. The field is also notorious for long hours, especially early in the career where there is fierce competition for jobs. Medical degree – you first train as a doctor, and then you transition into research, often by doing a PhD after medical school whilst doing your junior medic training. If you take this route it can take 10-12 years before you’re fully qualified in medicine and able to run a research program. PhD in biomedical sciences – you go straight into a PhD, which takes 4-6 years, and then move into academic research roles. If you’ve taken the PhD entry route, this path is not particularly good at broadening your career options, because the career capital you gain is mainly relevant to careers in medicine and biology. The most common exit options are academic roles focusing more on teaching and/or administration than research, roles in allocating research funding and public health. If you’ve built quantitative analysis skills, there is also the option going into data science. If you’ve taken the medical degree route, then you’re in a much better position, because you can go back to medicine, as well as the options above. Another potential positive is that biomedical researchers may be able to use their expertise to reduce the risks from natural pandemics and dual use research. Some researchers publish scientific papers at a rate at least fifty times greater than others, and the distribution appears to be log normal.9 This is what we would expect if publishing papers was a multiplicative function of several independent skills. The distribution of citations is very peaked: the top 0.1% of papers have 1000 citations, compared to ~1 citation per paper at the median. The citation distribution may be more skewed than the true distribution of impact per paper, because it’s exaggerated by feedback effects in which one paper becomes the standard paper that everyone cites. Nevertheless, we suspect the basic point that some papers are vastly more influential than others remains. What traits are important for success? How can you work out whether you’ll fit this career? Assess yourself on the traits above. In particular, try to think of concrete situations in which you have demonstrated these traits before. For instance, when doing science experiments in school, did you enjoy the times when things went wrong or were difficult and unclear? Did you find yourself motivated by curiosity (rather than simply by success) and unfazed by uncertainty? Speak to several people in the field and read extensively about the nature of the work, particularly in your areas of interest. Do a summer placement in a lab. This was suggested by several people as one of the best indicators. After your PhD, reassess your chances of success, including on the concrete signs looked for by lab managers below. What concrete signs are looked for when entering the field after your PhD? Several publications: First author on a Nature paper would be very good, second or third author on a Nature paper and lead author on a few others would be more common. A strong reference: This is a useful differentiating factor, especially because they normally know the referee. Statistics, programming, maths and technical skills that are especially needed by the lab (e.g. imaging at the moment), or other relevant hands-on experimental experience. Should you do a medical degree or a PhD? Among the people we interviewed, there was no clear consensus. Medicine offers better backup prospects and is more motivating to some, but the PhD route is faster, allowing you to get into research more quickly. The more committed you are to research, the more the PhD route makes sense compared to the medical path. If you think you’d find either path motivating, then we’re tempted to lean towards the medical path for the increased flexibility. In the future, we want to investigate the prospects of entering from PhD’s in other sciences and applied mathematics. Do you need to do a PhD at all? We’ve been told it’s possible to go into research roles without a PhD if you have programming or statistics skills, because these skills are highly in demand. Depending on your background, it may be possible to enter directly into informatics and data analysis roles. Otherwise, something like a Masters in Bioinformatics could be a good path. If you’re interested in biomedical research, therefore, learning to program seems like a good step, since it keeps your options open in lots of other areas too (learn more in our software engineering profile). The same goes for data science. How good are the opportunities for biomedical research outside of academia? How promising is entering biomedical research from PhD’s in other sciences? For example MIT’s admission page: “Does it matter if I'm a chemist, physicist, or mathematician rather than a biologist? Yes, it means that we're really interested in you! Our program is designed for students with diverse backgrounds, and students who have majored in chemistry, physics, and mathematics as undergraduates have done extremely well here.” MIT Department of Biology: FAQ About Applying. 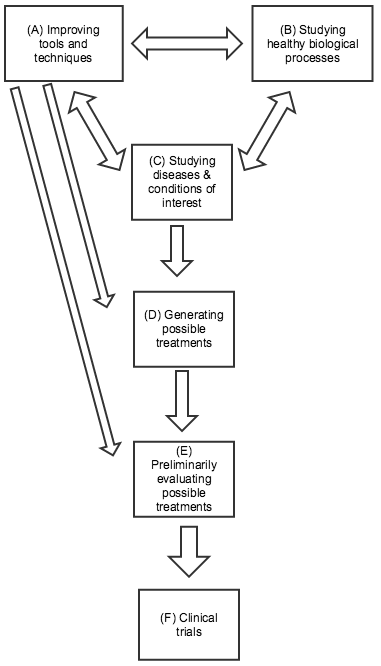 Bhaven N. Sampat APPENDIX D. THE IMPACT OF PUBLICLY FUNDED BIOMEDICAL AND HEALTH RESEARCH: A REVIEW. National Academies (US) Committee on Measuring Economic and Other Returns on Federal Research Investments. Washington (DC): National Academies Press (US); 2011. Murphy, Kevin M. and Topel, Robert H. (2006). ‘The Value of Health and Longevity’, Journal of Political Economy 114(5), 871–904. A top researcher would lead to more and better research than the grant money. A top researcher would attract more grants for the lab in the future.